Kuta Beach in Bali has always been the dirtiest beaches in Bali. Though this beach is an icon for tourism in Bali. Being in the crowded center of Bali, with thousands of people from different countries, but the beach is very dirty conditions worsen the image of Bali as the best island in the world. Because garbage is always piled on the beach, without a serious and continuous handling of all parties in Bali. Garbage on Kuta Beach is submissions from the river that surround the coast. Trash washed up river during the rainy season which ssering occurred in September to May. 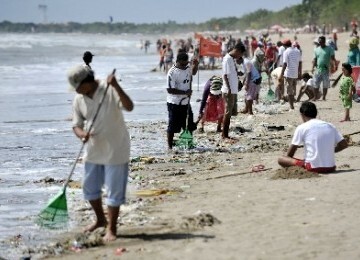 Each end of the year and the beginning of the year at Kuta Beach is always soiled by garbage. The conditions were very embarrassing for Bali. Ironically garbage that comes from residential and shopping around the river. The traders and the coastguard in Kuta each morning always clean up trash that washed up on the beach. They pick up and transport the waste to iklas without pay from the government. Because they feel Kuta Beach is where they make money and work all day. If the beach looks very dirty, then the loss is the workers around the coast. They would be embarrassed if asked by tourists about the garbage piling up on the beach. The efforts of workers around the beach is very appropriate for the appreciation and any support given serious. Because they have been keeping the beach with sincere iklas. Every effort has been made by the government to stop the garbage heap is always the case at Kuta Beach. However, efforts are made not maximized. Still occur piles of garbage on Kuta Beach. Indispensable support of communities around the river to always maintain the cleanliness of the river. They must have a high awareness of the cleanliness of the river. Because the people who live on the river are the ones who most know the condition of the river. Bali dubbed as the best island in ASIA, but the beach was very dirty conditions are not comparable with the predicate. Even Bali also received the title as the second best islands in the world. But the real conditions in Bali was terrible. Garbage everywhere. Makes the display becomes very poor and dirty. This condition is very alarming. Foreign tourists who should get the satisfaction and comfort in Bali, must feel bad to stay together with a pile of garbage on the beach, in the river, in the market, by the roadside. Garbage everywhere in Bali.